Original liturgy and worship resources from the viewpoint of a Christian pastor serving in the Moravian tradition. We'll be using this at East Hills Moravian Church as we offer blessings on behalf of our graduates. Besides the liturgy, we'll have a special time of praying for the people marking such transitional milestones. Using projected photos--both baby pictures and senior pictures--we'll be able to pray for each graduate in a personal way. From the very beginning, from before we even slipped into this world to gulp a first breath and wail a borning cry, God has cared for us deeply. Like a mother snuggling her cheek against her newborn’s fuzzy head, like a father amazed by his infant child’s fingers and toes, so has God marveled at us and nurtured us. When we have been open to the joys of discovery, when we have been enchanted by a shiny soap bubble blown through a plastic wand, or fascinated just to watch a toad in the backyard, God has shared our delight. When we have hoped to become astronauts and ballerinas and Jedi knights and princesses, God has smiled. As we have grown a bit each day—in body, mind and spirit—God has taken pride in our progress. In the thick of becoming self-aware, when we have begun to sift out our talents and fine tune our interests, when we have started to catalog our abilities and unleash our uniqueness, God has provided inspiration. For every milestone we have collected, every “first” we have undertaken, every accomplishment we have earned, God has cheered us on. At all of our crossroads, God has hoped to be consulted. In all of our decisions, God has desired to be included. In our maturing, as we have created the relationships of a lifetime and engaged in purposeful work, and as we have journeyed through nights of dark challenge and days of brilliant opportunity, God has empathized with us and provided encouragement. We are not always at our lovable best. In our moody moments and selfish months, our unflattering tantrums and our awkward stages, God has seen us through, waited patiently, kept us close. In every age, in every stage, God’s constancy has been and will be the hallmark of God’s unconditional love. We practice love on one another because God first loved us. Amen. Love is what draws us here. Our desire to be loved entices us. God’s creative love unites us. Love is what fills us here. A handshake or embrace warms us. Love is what encourages us here. A compassionate tale stirs us. A need made known prompts us. God’s pervasive Spirit inspires us. Let us practice such love with hearts open to God and God’s possibilities. Let our worship be a wondrous act of love! We used this at East Hills Moravian Church in 2008. At the conclusion of the litany, we took time to record our sins on slips of paper, nail them to the cross, and later burn them in an outdoor ash can (a tradition for which we thank our former student pastor Josh Viste). Fixate on Jesus and his woundedness. Cry for Jesus and his anguish. Inside your own skin, what does it feel like to be betrayed, rejected? Inside Jesus’ skin, what did it feel like to be betrayed, rejected? Who is not distressed by His followers’ abandonment? Who is not horrified by the violence of the outcome? Yet who among us is innocent of desertion? Who among us is guiltless to the core? Who here has inflicted further wounds upon The Savior? Name the abuses of Love that injure Him as sharply as the whip, the thorns, the nails. We lash out and leave stripes by our impatience, our bitterness , our arrogance and our envy. We raise welts by our unkind words, our icy attitudes, our thoughtless actions. We cause scars when we are self-centered , when we put our own desires ahead of another’s needs. We do damage when we are indifferent just as surely as when we are malicious. We draw blood when we claim him as Lord, then fail to follow where he leads. Aren’t we despicable? Aren’t we condemnable? So you would think. . . . This Christmas hymn is sung to the well-known tune Jingle Bells. I wrote it a few years ago, and it was featured on the favorite Moravian Church publication known as "the bulletin back." I am often requested to share the words with others, so here they are. Celebrate! In this crowd sing out loud: Glory to the One! God has made things personal by sending us the Son. In this crowd sing out loud: Glory! Allelu! Celebrate the birth of Christ --the day of his debut. To rule with power and might, to give them what they dreamed. What a big surprise! The Savior was a child! The Christmas story goes to show God’s plans are really wild! God’s love is for all, there can be no doubt. The poor, the weak, the small--no one is left out! God wanted to draw close to us, and that is why we cheer! The lyrics to this fun and spirited Christmas song were written by the 4th/5th Sunday School class and their teacher, Laura Kemmerer, at East Hills Moravian Church. Written to the tune Rockin' Around the Christmas Tree, the congregation joined in easily and heartily when we sang it yesterday during the annual Sunday School Christmas Worship Celebration. The 4th and 5th graders are glad to share their creativity with the world. If you make use of this song, though, please let me know so that I can tell the kids. "Tell the world our Lord's new story!" To praise our newborn King!" I'm a morning person. I covet the still beauty of the six o'clock hour, the promising moments of a new day when hope and inspiration are available in quantity. It is in the first light of dawn that I am most ofen aware of God's presence. Not coincidentally, it is also in the first light of dawn that I often experience a bubbling up of ideas and an undeniable urge to respond creatively to the Creator. It's as though God shows up at my house and brings me a present: a basket piled high with gorgeous, unblemished, just-picked oranges. 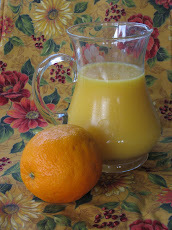 My first task is to press those plump orbs of citrus and collect the pulpy, tangy juice in a pretty pitcher. But the juice is abundant, and as the pitcher comes close to overflowing, my second task becomes clear: I must find a way to share this juice! So there you have it: Freshly Squeezed.